St. John’s, Antigua, CMC – Barbados Pride defeated Leeward Islands Hurricanes by 110 runs in the second day/night semi-final of the Regional Super50 against at Coolidge Cricket Ground here last night. 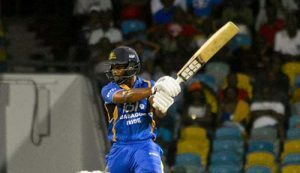 Shai Hope’s career-best hundred lifted was enough to lift the Bajans to a challenging total after opting to bat first against hosts Leeward Islands Hurricanes, Pride finished on 314 for seven off their 50 overs, with the right-handed Hope carving out a superb 125 off 108 balls. Opener Kraigg Brathwaite weighed in with 54, captain Jason Holder stroked a breezy 26-ball unbeaten 42 while Roston Chase chipped in with 31. Off-spinner Rahkeem Cornwall (2-53) and Jason Campbell (2-70) finished with two wickets apiece. Kevin Stoute took the attack to the bowlers, striking four fours in 21, as the aggressor in an opening stand with Brathwaite worth 42 runs, putting Hurricanes on the back foot. Brathwaite then put on 77 with the second wicket with Hope who then added a further 83 for the fourth wicket with Chase, to energise the innings. The right-handed Brathwaite was his usual patient self, facing 84 balls and counting five fours, and it was left to Hope to provide the impetus in an innings laced with eight fours and five sixes. He raised three figures in the 42nd over off 95 balls and when he finally departed in the 46th over, Holder arrived to lash two fours and three sixes to further accelerate the scoring. Holder put on 33 for the seventh wicket with big-hitting Carlos Brathwaite whose 27 came from just 11 balls and included three sixes. 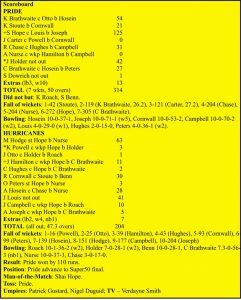 In reply, Hurricanes were sent packing for 204 all out off 47.3 overs with Montcin Hodge hitting the top score of 63, Jeremiah Louis ended 41 not out while Rahkeem Cornwall contributed 30. Leading the bowling for Barbados was their most successful bowler in this year’s competition, Ashley Nurse with 3-37 while Carlos Brathwaite had 3-56. Jamaica Scorpions and Barbados Pride will clash in tomorrow’s final where a new champion will be crowned.